Johnny Depp, all saddled and dolled up, has taken Hollywood's bull by its corporate horns, and waxed and caressed his reputation as one of the finest actors around. To collect the collateral on that reputation, Johnny boy plays a little hopscotch and does Secret Window, adapted from a Stephen King novella (Secret Window, Secret Garden). Now Stephen King is a man that can make a crib look scarier than the possessed baby eating a Barbie salad inside it. Depp plays the typical writer, Mort Rainey, looking for an idea for his new book; complete with caramel soaked hair, and living in a cabin in the nether regions of a small town. There is also a dog thrown in and eventually tossed out for good measure. We are introduced to John Shooter (John Turturro), a guy with an accent so heavy that it affects the gravitational pull of the moon and floods the woods. Mr. Shooter has a problem with Mort, who has a problem with standing upright. Mort keeps falling all over the place, and it makes you wonder if all that hair has made him top heavy. Shooter, complete with the drab attire and even drabber accent, claims that Mort is guilty of plagiarizing a story of his, and that to set matters right, Mort had better change the ending. But in the interest of making the movie longer and more painful, Mort has a problem in coming to terms with the reality of the predicament he's in, namely refusing to cooperate with Shooter. On top of it, he has a soon-to-be ex-wife, Amy (Maria Bello), complicating matters by getting her house burned down. Well, in all fairness she had nothing to do with it. Some dude switched champagne for gasoline and played chicken with the lighter. Added to this stew we have a little helping of the other man, Ted (Timothy Hutton), who pushes and then gets pushed. He contributes to Mort's anxiety by giving him the impression that Shooter is in cahoots with him, given that he, Ted, is responsible for the Morts' impending divorce. The 'other men' have always found the pickings tough, and Ted is no exception. He is more like the third wheel on a unicycle. Now to handle the nuisances called Shooter and Ted, Mort rehires his private investigator (Charles S Dutton) to take care of any complications that may arise. They do arise along with heavy irritation, and Mort is forced to take evasive action. He does so by falling again. There comes a time in every writer's life where he has to cover up a crime that he hasn't (in movie reality) committed. It can be the murder of two random people or two people who are crucial to the story. In this case neither of the two situations holds true, and Mort drives the truck (the incriminating evidence) into the river and is very surprised at the splash that it makes. Keeping with the idiosyncrasies that are always present in a thriller set in the middle of nowhere, we have a sheriff that sews. He gets those many cases in that part of the world. Yes, the one with the cousin in the Marines that does ballet. The sun also never seems to shine on small towns, and we always have the any-minute-now-he's-gonna-jump-out-and-eat-babies music. 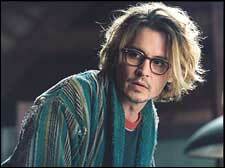 Secret Window has its share of shock therapy, the first in line being Depp's decision to be a part of it. Sadly, like some of the co-actors and members of the audience, Mort's dog, Chico, also gets screwed. How Mort, whose jaws by now have decided to pack their gums and leave the skull, comes to terms with Shooter and his own fetish for the bathrobe he wears throughout the movie, forms the crux of the story. He gives new meaning to the term 'pushing up daisies', as some characters are forced to push up corns. The point with a movie like this is that if you've seen one you've seen them all. And to see them all sorta negates the whole point of watching just the one. After Pirates Of The Caribbean, which was phenomenal, why Depp would want to do a movie like this is beyond me. Heck, a lot of things are beyond me. If you are gonna watch this film then watch it only to see Depp sashay the bathrobe. Everything else is poppycock. fullhyd.com has 700,000+ monthly visits. Tell Hyderabad what you feel about Secret Window!